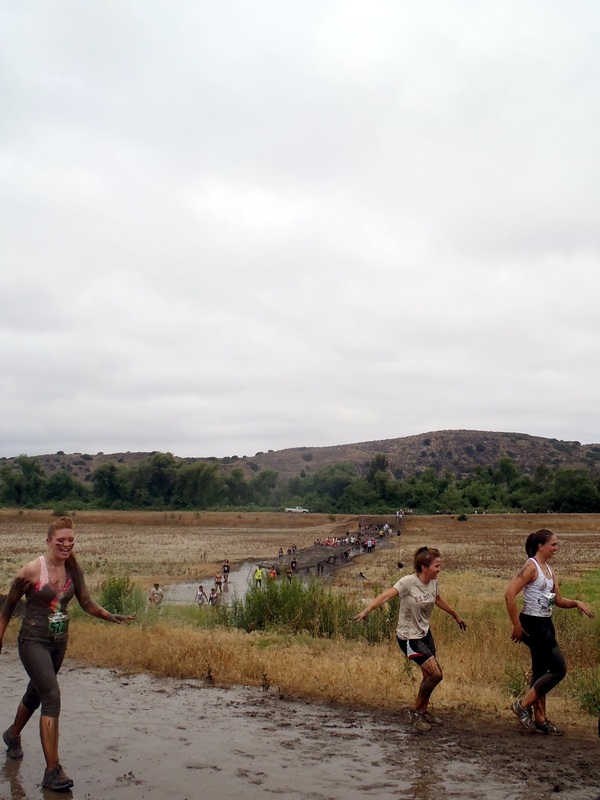 Standing thigh deep in the crowded mud pit, I stared at the high obstacle and debated if I needed the help of the two Marines stationed below the wall. Making my decision, I waved them off and placed my hands on the top of the wooden plank and jumped. As the thick brown soup reluctantly released my shoes, my heavy mud-caked clothes transformed my great leap into a tiny hop as my arms struggled to heave up the extra weight. With a final grunt, my stomach reached the ledge and I swung my feet to the top. 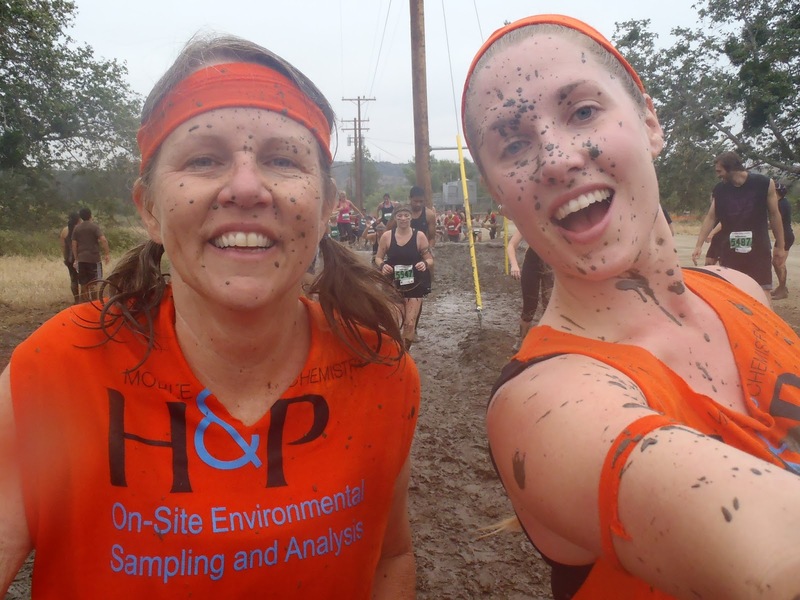 Raising my arms high, I leaped into the deep wallow on the far side followed by a cold surge of viscous mud shooting up under my shirt. Such fun! On Sunday, Tori and I ran the Camp Pendleton World Famous Mud Run with my friends from work. (Louise, Sam, Suzie, Scott, Dave, Tiffany, Holly, Josh, Kurt, Jessie and Justin) Since we had a bunch of Neon Orange extra large shirts lying around the office, we transformed them into racing outfits to help keep track of each other on the 10 kilometer course. Tori cut her shirt into ribbons and tied them up the side while I changed mine into a cape. 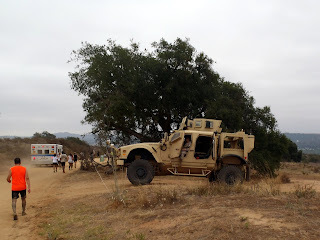 When we arrived at the military base at 7:15am, there was a long line of cars at the front gate, but we found decent parking close to the race venue at Lake O'Neill. Meeting up by the main stage, we checked our bags and waited for our 4th wave to start at 9:30am. It was still cool and overcast when our wave departed the Start Line so we were not looking forward to the 1st Obstacle, a fire truck parked on the side of the road that sprayed us down with its Fire Hose as we ran past. 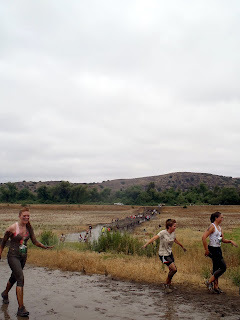 Turning off-road, the dirt trail soon wound toward our first taste of mud, the Steeple Chase. 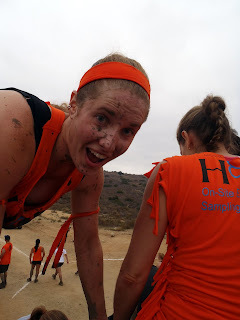 The 2nd Obstacle was a short wall in the midst of a shallow mud pit. 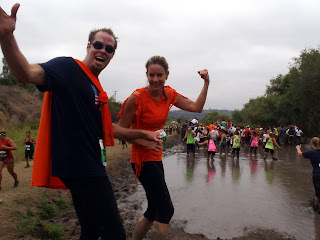 It was only ankle deep, but it covered our shoes and filled them with squishy mud. The trail then turned into a section of deep sand for the 3rd Obstacle, Omaha Beach Crossing. The course began to climb for a long distance as we approached and passed through the infantry training area, Combat Town, on the hillside. At the top, a huge crowd gathered as we waited in line for the 4th Obstacle, the Cargo Net Climb. 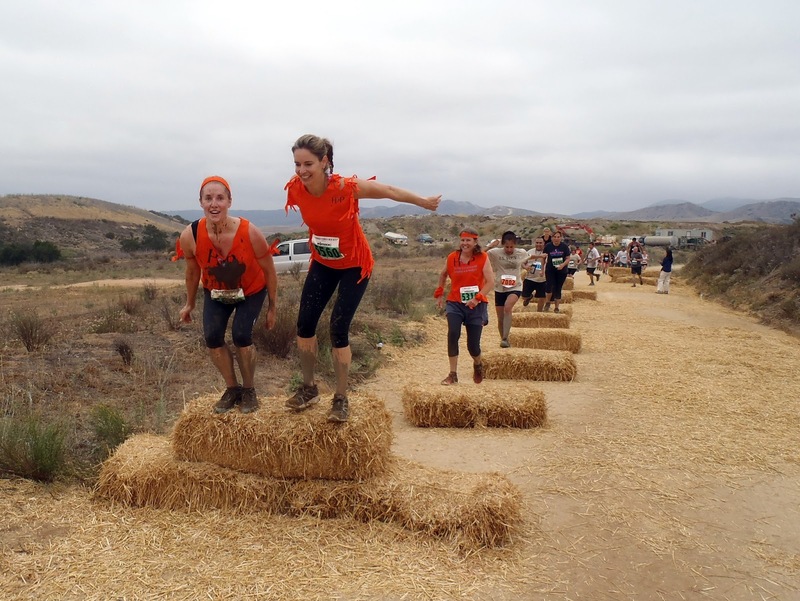 After emptying my shoes of mud, we ran along the ridge-line hopping up and over the series of hurdles in the Straw Bale Challenge before the road headed back downhill. 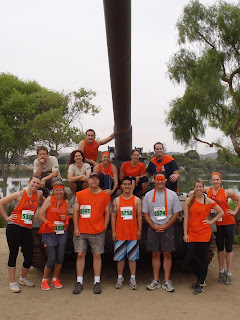 As we neared the bottom, we reached a cluster of obstacles around the reservoir. 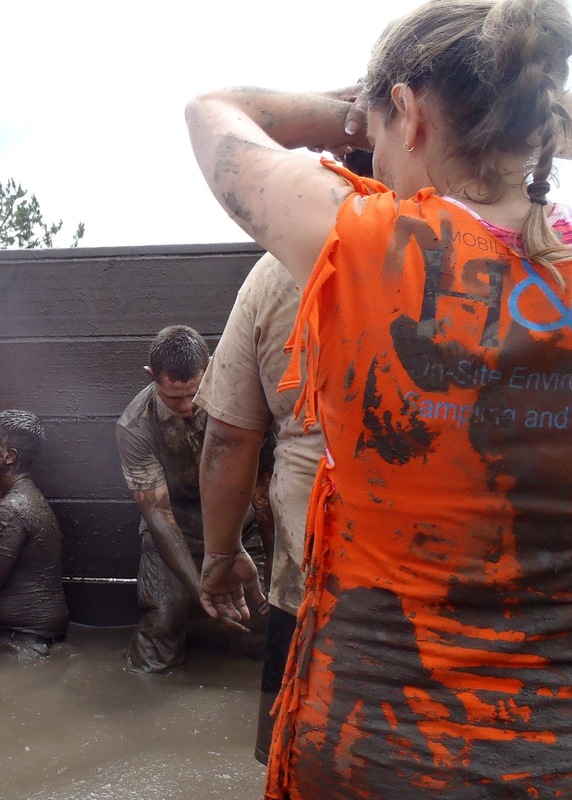 The 6th Obstacle was Guadacanal, our first deep mud pit with a chest high wall in the middle. 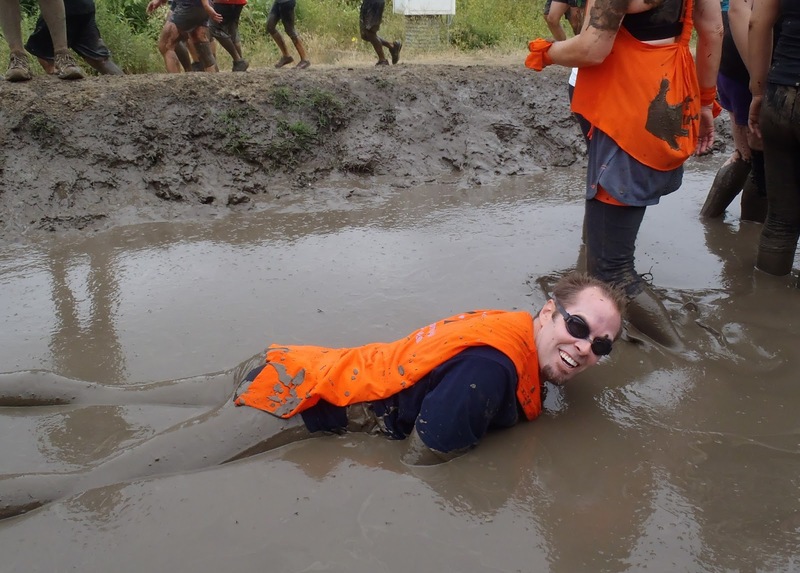 Putting on my swim googles, I did a belly flop in the mud. Close by, we descended into the empty Chosin Reservoir where we had to crawl under four series of camo nets strung along the reservoir floor and back up the side. 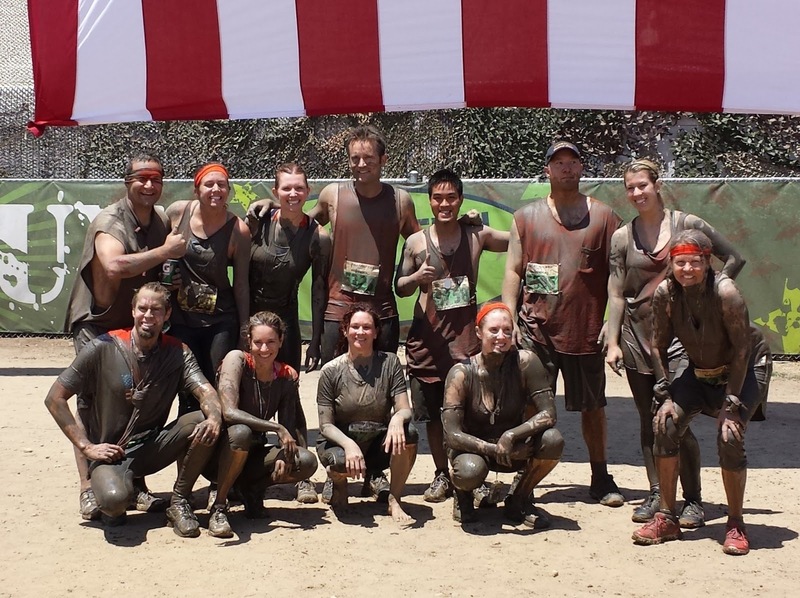 It was muddy, but there was enough gravely sand to wear out my kneecaps. 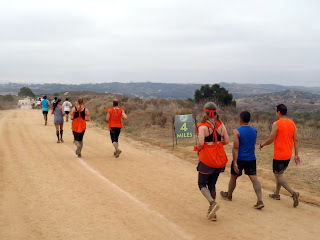 Leaving the reservoir behind, we found the 8th Obstacle, an even deeper Mud Pit with a head high wall. The group of Marines helping runners over were covered head-to-toe in mud and looked exhausted. 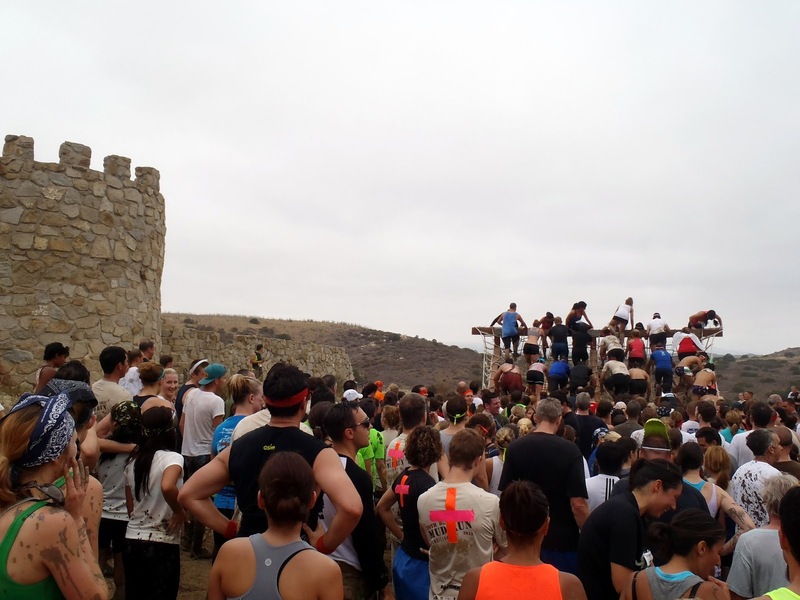 Some runners were just slithering over the wall and dropping into the pit beyond, but many were standing up and leaping with the bravest cannon-balling, flipping or belly-flopping off the top. On the other side, we had to crawl through one of the long narrow plastic tunnels. 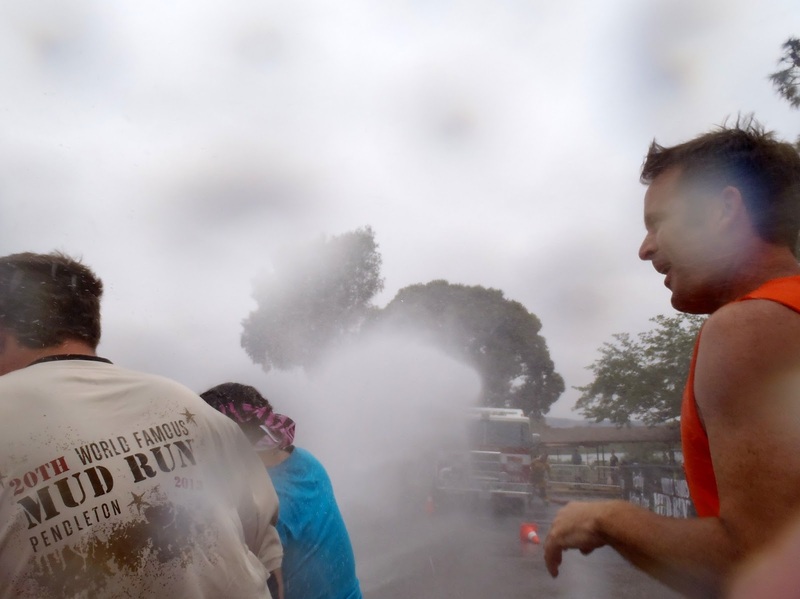 By the time we made it to the next obstacle, the steep Slippery Hill covered with sprinklers, my right knee was really throbbing. I had to walk backwards down the other side of the hill to give it a rest from the downhill pounding. In the last mile, we encountered the last two obstacles, the Over/Under where he had to climb over or crawl under a series of logs. Being tall, going under the lower logs was the hardest. Spectators had gathered around the 11th Obstacle, another low camo net to crawl under. Exiting the nets, we were ordered to stay on our hands and knees as we entered the Mud Pit on the other side. Ducking our heads under the flagged lines, we floated in the mud and pulled ourselves forward with our fingers. It was nice to relax the legs for a bit. As the sun came out near the end, there was a final shallow pool of mud where we did push-ups before running for the Finish Line. 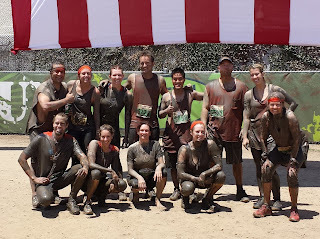 After our muddy companions gathered for a group shot under the giant American flag, we got in line for the showers. I tossed my muddy shoes into the donation container and threw away my shirt, cape, and socks before entering the Hog Wash so I was able to get decently clean in the short time allowed under the cold spraying nozzles. 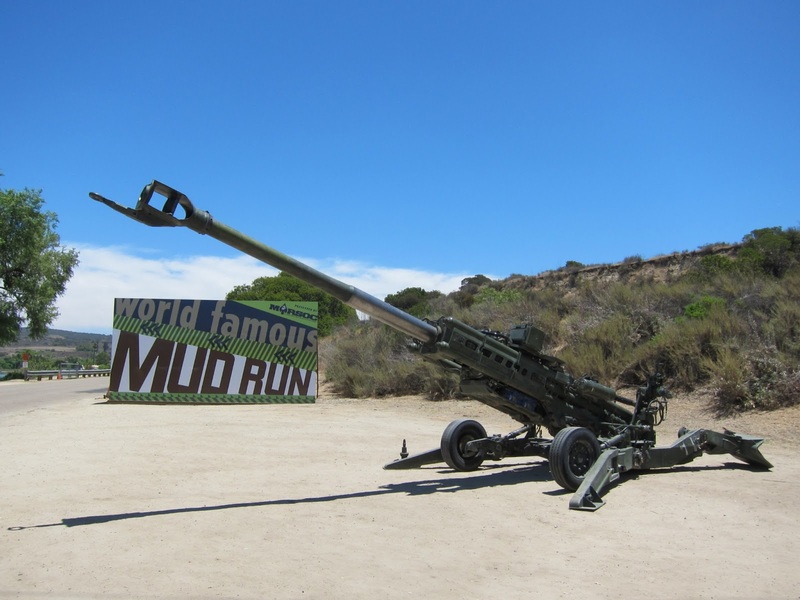 Several Marines kept shouting, "Get out of my showers!" with bullhorns as we shuffled through as quick as possible. Changed and mostly clean, we all headed over to Pizza Port for food and beer to celebrate. We were starving!